The quintessential representatives of Ukrainian folk culture - pysanky, or Ukrainian Easter eggs - are once again making an appearance at The Ukrainian Museum. Presented in an exhibition featuring hundreds of exquisitely decorated eggs, these harbingers of spring delight the eye with a welcome medley of color in contrast to the still lingering grays of winter. The Museum's pysanky exhibition will be on view from March 25 to July 2, 2006. Ukrainian pysanky have a legacy that dates back to prehistoric times, when ancient people attempted to understand and explain their greater and immediate environment. The universe, the sun, the changing seasons, birth, death - these were among the mysteries that taxed the comprehension of people as they struggled to find answers to the natural phenomena that governed their daily lives. They developed myths to mollify their fears of the unknown and appease the forces over which they had no control. As an example of the mystery of life itself, the egg was considered enormously powerful. Ancient people decorated the egg with symbols and colors that held a special meaning and used it for numerous social events and religious occasions, specifically in the spring. Thus the egg became a precious talisman, believed to have protective, magical properties. Prominent examples of such potent symbolism can also be seen in the pysanky on display as part of the Museum's current exhibition The Tree of Life, the Sun, the Goddess: Symbolic Motifs in Ukrainian Folk Art, which runs through October 15, 2006. The designs on pysanky are, for the most part, geometric, with some plant and animal forms. The most prevalent and recognized motif is the stylized symbol of the sun, which appears as a triangle, a broken cross, an eight-pointed rosette, or a star. Endless lines symbolize eternity, while images of animal and bird figures, such as a stag or a rooster, represent fertility and strength. The introduction of Christianity to Ukraine brought with it such elements as the cross, the fish, and images of churches. The art of creating Ukrainian pysanky (from the word pysaty - to write) has been handed down from generation to generation. 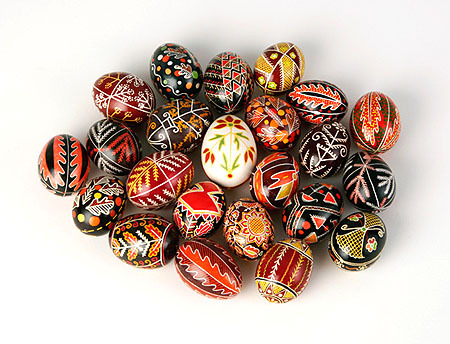 Although most of the relevance of the intricate designs and patterns, as well as the use of specific colors, has been lost over time, decorating pysanky and adhering to some of the customs associated with this craft have remained a strong tradition among the Ukrainian people to this day. Pysanky are decorated using the wax-resist or dye technique. The tool used to draw the design on the egg is known as a kistka or ryl'tse. While the dyes now used are chemical-based, not too long ago they were made from natural sources, such as vegetables or the bark of a tree. The colors used in pysanky have symbolic meaning as well. For example, red is the color of life, joy, or the sun, while yellow stands for fertility and wealth. Although present-day Ukrainians decorate pysanky and exchange them in the traditional manner at Eastertime, the eggs are considered works of art and are treasured for their uniqueness and beauty. While no longer revered or considered to be a talisman, Ukrainian pysanky are still a magnificent example of the ingenuity and artistry of Ukrainian folk culture. PYSANKY DECORATING WORKSHOPS. Open to adults and children over 12 years of age, these workshops will be held on March 18, 19, 25, 26 and April 8 and 9, 2006, from 2:00 to 4:00 p.m. The fee for each session is $15 for adults, $10 for students over 16 & seniors, and $5 for children 12-16. Members receive a 15% discount. Reservations are required. A DEMONSTRATION in the making of pysanky will be held on Saturday, April 15, 2006 (the day before Easter) from 1:00 to 5:00 p.m. Accomplished artists will create beautiful pysanky, demonstrating the techniques used to decorate the eggs. Director Slavko Nowytski's award-winning film Pysanka will be screened at half-hour intervals. The fee is $10 for adults and $8 for students over 12 & seniors. Children 12 and under are admitted free, and members receive a 15% discount. The fee includes admission to the Museum's exhibitions. Hours: Wednesday-Sunday 11:30 a.m.-5:00 p.m.